어떻게 하면 사랑한다는 표현을 자연스럽게 할 수 있을까? 사랑한다는 말은 어렵지 않아요. 온 세상을 사랑으로 물들일 맥주가 등장했답니다! 전 세계에 우리말 &apos;사랑해&apos;를 알리기 위해 I love you로 표현하지 않고, Sa.Rang.Hae라고 표기했어요. 사랑해 화이트 에일은 밀맥주로, 미세하고 크리미한 거품이 부드럽게 목을 타고 넘어옵니다. 한 모금 머금는 순간, 입안 가득 감미롭고 산뜻한 바나나 향이 은은하게 맴돌아요. 홉의 쓴맛보다는 달콤하고 설레는 첫사랑 같은 느낌이 두드러지며, 안정감 있는 바디감이 특징! 누구나 마시기 편한 목넘김으로 가볍게 즐길 수 있고, 어떤 음식과도 조화롭게 어울려요. 맥주는 세계적으로 밀맥주를 가장 잘 만드는 100년 전통의 독일 바바리아 지역에서 생산되었어요. 1516년 독일에서 제정된 &apos;맥주 순수령&apos;에 따라 부재료 없이 밀 맥아, 맥아, 홉, 물을 사용했답니다. 깔끔하고 진한 밀도감이 느껴지며, 풍부한 밀의 맛과 특유의 바나나 향이 어우러져 완성도 높은 맥주가 탄생했습니다.  제품의 라벨 디자인은 사랑스러운 개구리가 장미꽃을 건네는 모습이죠. 논에 사는 개구리가 사랑해 화이트 에일을 마시고 우리에게 익숙한 개구리 왕자가 되는 이야기를 담았습니다. 배경에는 맥주의 재료가 되는 물과 밀을 표현하였고, 로맨틱한 장미로 여심을 공략했답니다. 사랑하기에 가장 좋은 때는 없습니다. 지금, 당신의 사랑을 표현하세요. 사랑해 화이트 에일로! How can we deliver our love naturally? It is not a big issue. A brand-new beer beer is released to spread the love all over the world! 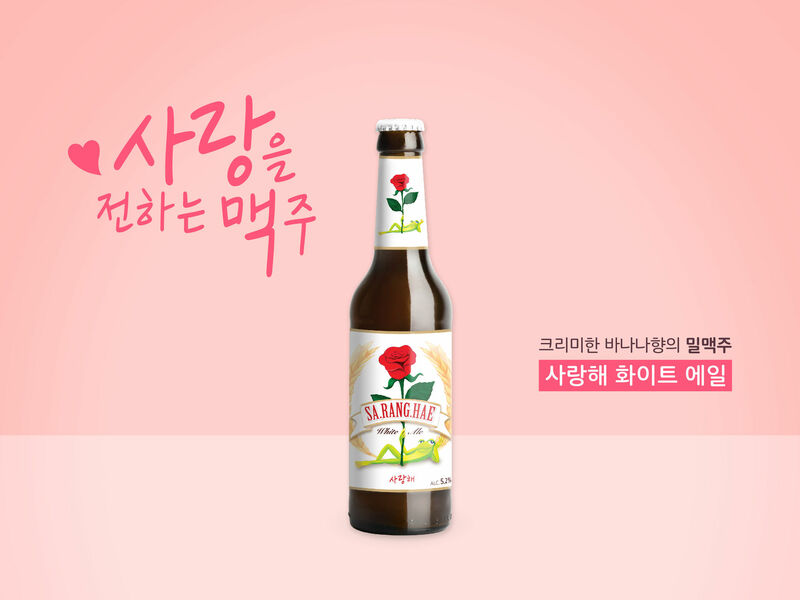 To let all the others know how to say "I love you" in Korean, we named the beer "Sa.Rang.Hae"
SA.RANG.HAE White Ale is an authentic Bavarian style wheat beer, served unfiltered with its natural yeast. With its fine-pored white foam, you can enjoy the smell of cloves and be impressed by the refreshing banana flavor of SA.RANG.HAE White Ale. A lovely frog in the label is handing a rose to you. The label contains the story that a frog in a paddy becomes a frog prince, drinking SA.RANG.HAE White Ale. 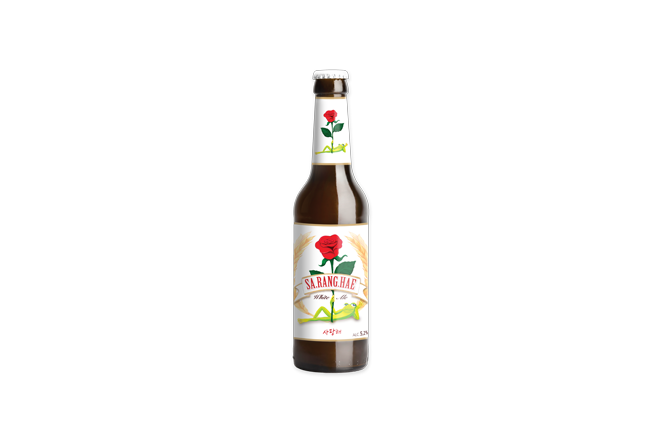 There are water and wheat which are ingredients of white ale in the back ground and a romantic rose to steal ladies&apos; hearts. There isn&apos;t best time to love. Now, express your love with SA.RANG.HAE White Ale!